As drought tightens its grip in the drylands of many East African countries, in Tanzania conflicts between farmers and pastoralists are set to increase. With insecure access to grazing lands, a lack of land use planning and continued encroachment of grazing areas by crop farmers and investors alike, pastoralists are often pushed from place to place with no real solution provided to their plight. This is no more clearly seen than in Bagamoyo district in Pwani region where Barabaig pastoralists have ended up, following ongoing evictions from one place after another, and most importantly from their homelands of the Basotu Plains. In Bagamoyo district such conflicts occur on a regular basis with livestock being slashed and killed, and crops being trampled and destroyed as pastoralists and farmers clash in a growing situation of increasing land competition. Such conflicts are bad for pastoralists, bad for farmers, and bad for investment. Bagamoyo is the site of a new industrial zone and competing to become sub-Saharan Africa’s biggest port. In addition the District has been targeted for large-scale commercial investment and being enviably close to Dar Es Salaam and the coast is rife with land speculation. with pastoralists from Bagamoyo how best land use conflicts can be resolved. In this context the Sustainable Rangeland Management Project (SRMP), financially supported by IFAD, Irish Aid, the International Land Coalition (ILC), the International Livestock Research Institute (ILRI) and the Government of Tanzania is working with national and local authorities to secure rangelands and the land rights of local rangeland users including pastoralists across the country through the implementation of village land use planning and land certification. The Project, led by the Ministry of Agriculture, Livestock and Fisheries and the National Land Use Planning Commission not only supports individual village land use planning, but more importantly joint village land use planning in order to secure resources such as grazing areas shared across village boundaries. Between 2010-2015 SRMP assisted nine villages to carry out village land use planning, and successfully piloted the implementation of joint village planning across three of these: Lerug, Ngapapa and Orkitikiti. 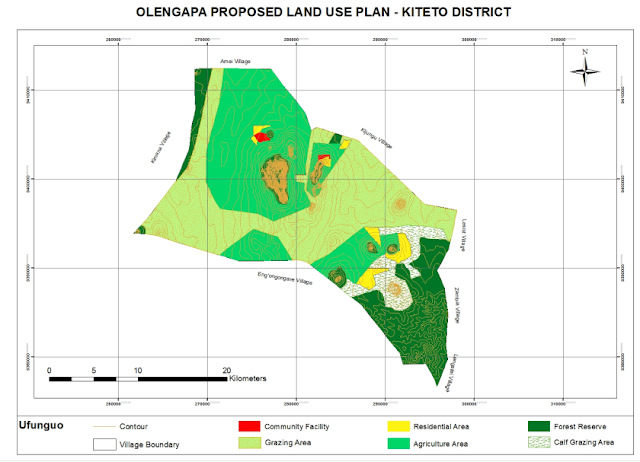 The process led to the protection and certification of a shared grazing area that has been called “OLENGAPA” to incorporate a part of each village’s name . 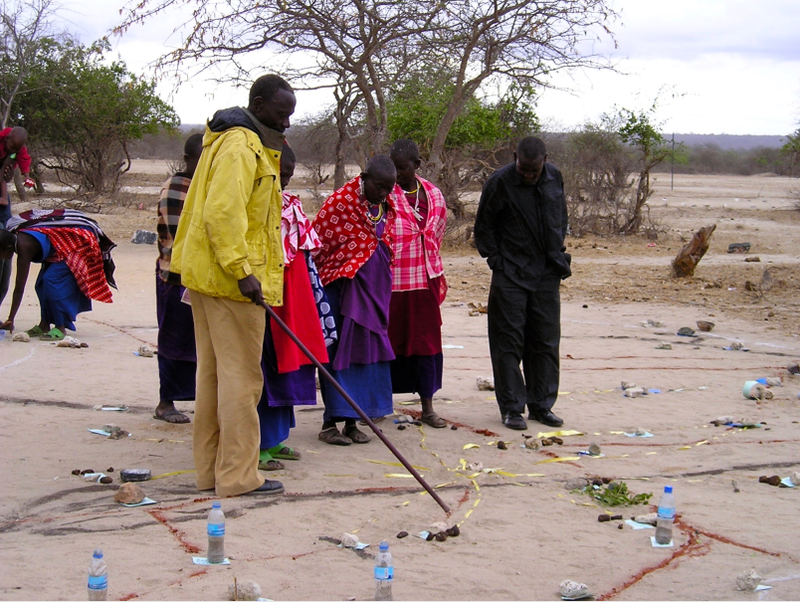 In the OLENGAPA area the SRMP supported the villagers to carry out a participatory mapping of the different resources in the villages and their distribution. This was used to develop a basemap for the village land use planning process, including showing which resources are shared by the villages and where they are situated. SRMP then facilitated village members to come to agreement over the individual village land use maps and plans, as well as the joint village land use map and plan, and the joint village land use agreement (JVLUA). These detailed and ultimately protected the shared grazing area, water points, livestock routes and other shared resources. 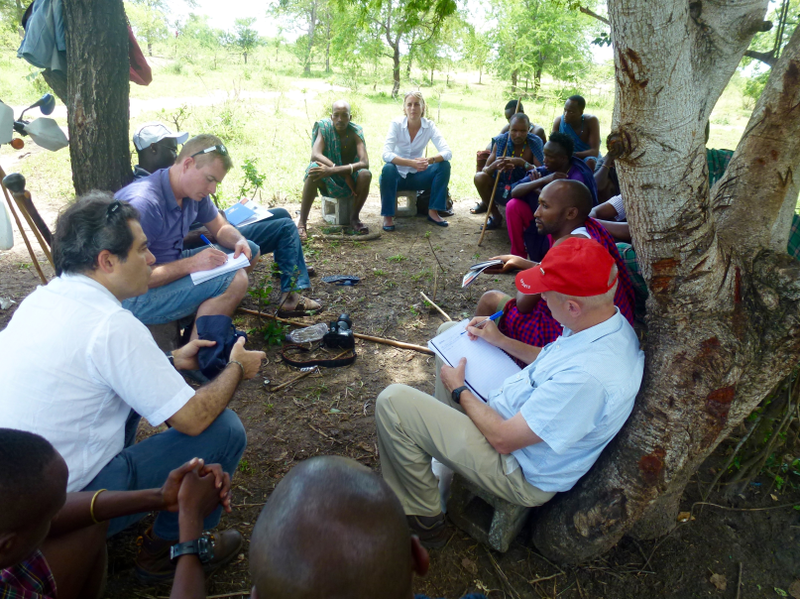 Reaching agreement was a protracted negotiation process between the villages and within villages between different interest groups, involving many community meetings and much investment of resources. In the end each Village Assembly approved the JVLUA, which allocated 20,706.73 ha of land for shared grazing – that is, around 40 per cent of the total area of the villages. By-laws for the management of the resources were developed and adopted. Following on from the approval of the JVLUA, the three OLENGAPA Village Councils established a Joint Grazing Land Committee made up of members from all three villages. This Committee is responsible for planning, management, enforcement of by-laws applicable to the OLENGAPA, and coordination of the implementation of the OLENGAPA land use agreements and joint land use plan. In addition a Livestock Keepers Association was established including 53 founding members with most households from the three villages being associate members. In January 2016 the Ministry of Lands approved and registered the village land boundary maps and deed plans for the three villages. The District Council has issued the village land certificates and the next step is for the Village Councils to begin issuing Certificates of Customary Rights of Occupancy (CCROs). The shared grazing area will require three group CCROs to be issued to the Livestock Keepers Association – one from each village for the part of the grazing area that falls under its jurisdiction. Signboards and beacons marking the boundary of the shared grazing area are being put in place. The details of the OLENGAPA process are detailed in a recently launched ILC Rangelands Initiative Issue Paper . A Manual to provide guidance on participatory rangeland resource mapping was published by the project in English and Swahili: “Field Manual to support planning and management in rangelands including in Village Land Use Planning”. SRMP has now entered its third phase (2016-2020), which will focus on the scaling-up of the joint village land use planning approach in several new clusters of villages, as well as expanding the original ones. This includes the securing of grazing areas through the provision of CCROs and improving the management of the areas by the established Livestock Keepers Associations through action research on rangeland rehabilitation, improvement, and on intensification of rangeland and livestock productivity. Activities will be undertaken in three regions – Manyara, Morogoro and Pwani. The locations of the new clusters of villages appropriate for joint village land use planning will be identified through a mapping of grazing areas, livestock routes, and VLUP interventions across a pastoral-dominated landscape or corridor stretching form Kiteto district (in Manyara region), through Kilindi district (Tanga region), Mvomero district (Morogoro) and up to Bagamoyo district in Pwani region. Not only does SRMP seek to secure rangeland resources for rangeland users, but it also aims to improve the enabling environment for current and future interventions. The SRMP is a component of the ILC’s Tanzania National Engagement Strategy (NES), a framework through which ILC members collaborate, strategise, and engage with government and other partners in order to effect positive change. In Tanzania the NES has two main components – land-based investments and rangelands where SRMP is a key mechanism for achieving the NES rangeland-focused objective of securing grazing areas. IFAD is supporting the NES to foster an inclusive policy dialogue for good land governance in the country. Through working closely with national and local government, SRMP aims to influence policy and legislation to provide a more enabling environment for securing the rights of local rangeland users including rights to key resources such as grazing areas and water, maintaining necessary mobility. The Project also aims to improve the participation of such users, women and men, young and old, in decision-making processes pertaining to their lands. SRMP will build the capacity of different actors to support the securing of rangelands, resolve conflicts between land users, and improve the management of rangelands through research, training and learning. The ILC Rangelands Initiative will assist cross-country and cross-continental exchange with other ILC members and their partners working in similar contexts. This includes through learning visits, study tours, meetings, and dissemination of results through publications, conferences, social media and other forums. Finally the SRMP aims to influence thinking in Tanzania to be more supportive of livestock production systems including pastoralism through advocacy and lobbying, not only for the land rights of pastoralists and other rangeland users but also to raise awareness on the benefits of and opportunities for investment in pastoral production systems. A key vision of SRMP is to garner support for and move towards the establishment of a Southern-Livestock Green Growth Corridor or “SLIGGCOT” across the pastoral landscape where the Project is working – stretching from Kiteto through Morogoro to Bagamoyo.